November 11, 2017, Clearwater, FL – It took an incredible performance from an incredible pitcher to cap an incredible trifecta. In the end no one was surprised. 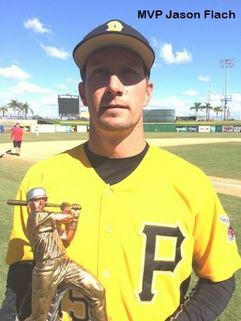 Jason Flach pitched his second complete game in as many days to cap a 42.1-inning week to lead the Carolina Pirates to their first Fall Classic championship, 3-1 over the Atlanta Braves. “I wanted the ball and told [Carolina manager Don Pustulka]last night that I wanted it,” Flach said following his brilliant six-hit effort. “There was some debate about it, and ultimately it wasn’t my call, but I still got it.” The decision may have been the best and easiest Pustulka made all week. Despite having been beaten 5-4 by this same Braves team in the finals of the Atlanta Memorial Day tournament and 3-0 during round-robin play, Flach was confident that a change in plans would pay dividends in this title game. The victory concluded a week in which the Pirates produced a unique playoff sweep of the three opponents they lost to during round-robin play. The previous day, Carolina topped the NY Isotopes 5-0 in the quarterfinals, with Flach earning the save following 3.1 innings of relief. Later that evening, Flach went the distance in a 4-3 victory over the top-seeded Patriatos to set the stage for title game. Luke Roberts drew a leadoff walk from Atlanta starter Jeff Craft. Drawing on their trademark small-ball style, a sacrifice bunt moved Roberts to second, before Mickey Munn staked the Pirates to a 1-0 lead with a double to left. Three innings later, Munn was at the center of another offensive spurt. His lead-off single to center and steal of second came two batters before Kirk Bennett’s RBI double to left pushed the lead to 2-0. When Roberts’ run-scoring single to right made the score 3-0 an inning later, Flach had all the support he’d need. Munn paced Carolina’s 11-hit effort, finishing 3-for-5. Pustulka said he’d been one of the few Pirates’ hitters to hit well all weekend. Carolina had several opportunities to increase the lead, but ended up stranding 11 runners on base, including leaving the bases loaded twice without scoring. Pustulka admitted that the missed chances weighed on him, but that with his ace on the mound his nervousness was short-lived. Trailing by three and running out of innings to stake their own claim to the title, Atlanta put together its only rally of the game. John Demarco led off with a walk and moved to second on Tom Nohstadt’s single to right. But, just as quickly as the rally began, one pitch all but put it to rest as Flach induced a comebacker that began a 1-6-3 double play. Still, Demarco went to third on the play and scored on Shawn Callaway’s single to left. The hit brought Atlanta within 3-1 with four innings to play, but the Braves would get no closer. Flach retired nine of the final 11 Atlanta hitters, allowing runners via only a two-out Bob O’Brien single in the seventh and an infield error in the eighth. He then set the Braves down in order in the ninth to clinch the title. While Carolina needed two playoff victories to reach the title game, Atlanta needed only Chris Evers’ complete game gem in a 9-1 blowout of the Criollos to earn a trip to the final day.